Maybe American troops have it too easy. The world’s two largest armies, China and India, exchanged training in kung fu and yoga last week in their first joint counterterrorism exercise, codenamed "Hand in Hand 2007." I would hate to be the FNG in this army. Chinese soldiers from the People's Liberation Army presented a "Hard Qigong," a form of deep-breathing training. It’s far more complicated than a Lamaze class. 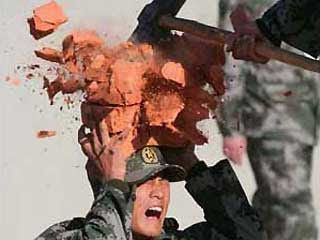 For the Chinese soldiers, it involves standing with bricks on their heads while other soldiers take a sledgehammer and smash the bricks. Qigong also includes withstanding aggressive attacks by bricks and wooden sticks, being lifted aloft with sharpened spears and splintering wooden blocks with bare hands. For the Chinese, "explosive hot potato" was much easier than stretching. As part of the expertise-sharing, the Chinese soldiers demonstrated their prowess by igniting explosives and passing them from soldier to soldier, with the last one ditching the device before it detonated. Mexico doesn't want its citizens, either. I Bring You the Ism! People wonder why I carry a gun. No Child Left Behind Getting Left Behind? Darn this Global Warming thingy!